The Higgs Boson or Higgs particle could destroy the entire universe according to claims made by renowned scientist Stephen Hawking. 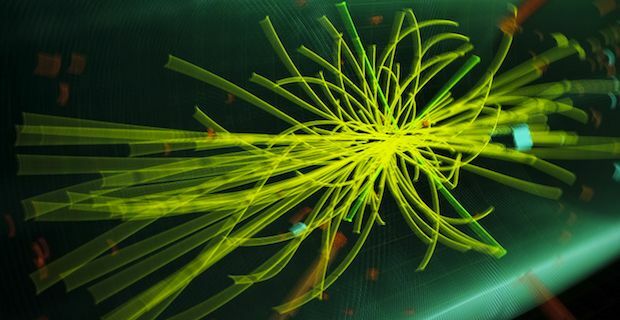 Last year there was a huge hunt for proof of the Higgs Boson, otherwise known as the god particle, which was first proposed by Physicist Peter Higgs and 5 other colleagues in 1964. It ended up being a very hard theory to prove but the particle was confirmed in March last year. Hawking makes some terrifying claims about the particle, which is present everywhere in the universe, in his upcoming book which is titled Starmus. He opens by saying "The Higgs potential has the worrisome feature that it might become metastable at energies above 100bn gigaelectronvolts. This could mean that the universe could undergo catastrophic vacuum decay, with a bubble of the true vacuum expanding at the speed of light. This could happen at any time and we wouldn't see it coming." But before we all start running around panicking about an impending apocalypse, Hawking explained what exactly would be needed to create 100bn gigaelectronvolts of energy saying "A particle accelerator that reaches 100bn GeV would be larger than Earth, and is unlikely to be funded in the present economic climate." To put this in context, the Hadron Collider has only managed to collide together particles at 3.5 tera-electronvolts per beam. This is significantly less than the huge figure that Hawking says would be required to create instability in the Higgs Boson and you need to keep in mind that the Hadron Collider is absolutely massive. This position on the Higgs Boson marks a huge u-turn by Hawking on the Higgs Boson after he famously once bet a large sum of money that the particle did not even exist.